Does it sound weird to hear someone mention they have a relationship with Christ? After all, how do you have a relationship with someone you can’t see or touch? 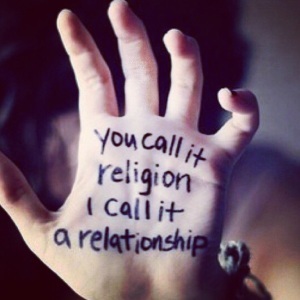 Religion and relationship are not two of the same, although they seem to commonly be lumped together. On one hand there is religion, with its traditions, rules, prayers, and rituals. A routine of order in which we speak to God, things we are taught to know, yet may never feel or fully comprehend. Religion is on the surface, something we do out of habit, but not necessarily whole heartedly. A relationship is understanding, a closeness or bond. A relationship with Jesus is full of love and grace. It’s a feeling, an indescribable rush of emotions. It’s knowing His love is greater than any other, it’s seeking something outside of ourselves, acknowledging that we cannot save ourselves and therefore need Jesus, and only Jesus. Its the conscious choice to put Him first in our lives, not just on Sunday, but everyday. It’s being on fire for Christ and wanting to live a life pleasing to Him, not for fear of condemnation, but because of the aching in our hearts when we fully grasp that Jesus died for us. All of us… and being able to accept the love, forgiveness, and grace He offers each and everyone of us every day. Feel free to share- or follow us on twitter- we post links to our blogs there as well.